I got married at Glenhaven Events and it was EXCELLENT! I got so many compliments on how beautiful the venue was and how smoothly everything ran. They really take care of the bride and groom from the day you pick your wedding date all the way to the end of the night when they pack up your decorations for you! The whole process is seamless, I couldn't have been happier. If you are looking for a beautiful wedding and don't want to lose your ming with stress, I HIGHLY recommend Glenhaven - you will not be sorry. My wife and I were married at Glenhaven Events in Farmington, MN on 11.24.18. Our experience we had echoed all of those who we we spoke with, which were either married at Glenhaven or another Fab Weddings location. George, Andrea, and Christine were awesome to work worth. From our initial visit of the venue to our wedding day they were involved every step of the way. Whenever we had questions about decorations or how a certain aspect would work they were very prompt in their response with an answer or recommendation. These days with all the options you have available to you with getting married, for us personally, we chose the place that we knew would provide the experience, not just the best price (although hard to beat their packages), and Glenhaven/Fab Weddings were the ones who provided that for us. George's expertise and experience was invaluable, whether he was helping us with our timeline or making recommendations on day-of events, he was a great collaborator while still allowing us to bring our vision of our big day to the venue. On our big day, Christine and her staff were on point with timing, setting up, tear down, and making sure our vision came true. 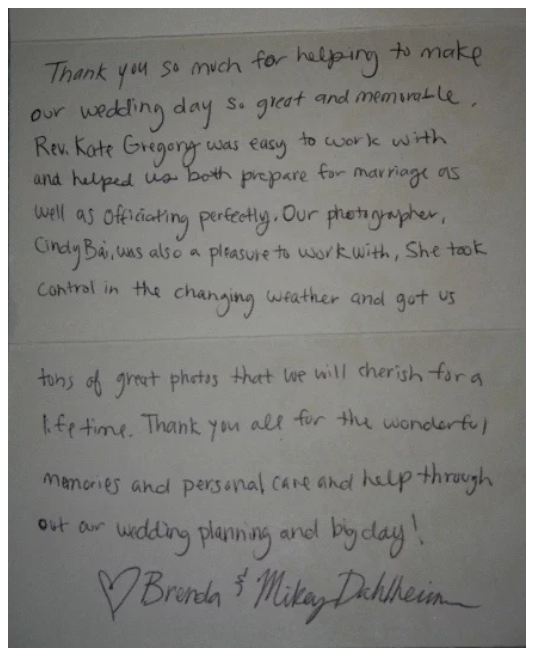 Even with us throwing them some curveballs at them the staff was excellent and their ability to quickly convert the room from the ceremony to dinner was painless. After looking back on our wedding day, the only minor recommendation we have is although the staff was very attentive it would be nice to have a staff member dedicated to the bride and groom/head table/wedding party to help assist with drink service. Your wedding day is very busy and at times very hard to be able to slip away to get something to drink. This would be very helpful to the those individuals and a very nice touch in the future. Again, this is a very minor detail in the grand scheme of things and in no way took away from how excellent our service was. The food was amazing, we number of compliments we received on dinner was just another tip of the cap to Brianno's and their already very well established catering reputation. We chose the pasta bar and would do it again if we had to go back and make this decision. We also used Farmington Bakery for our dessert and their staff was awesome as well. They made a custom s'mores bar that was a huge hit, so much so that we weren't even able to get our hands on one the night of, which is a good thing! But we did have our amazing two-tier cake that was delicious! Their staff was so great that once we told them how huge of a hit the s'mores bars were and that we didn't get any, they made a small batch for us to have at home, so thank you! Cue DJ Steve, he got the place rocking right from the get go and kept it going all night. He was super easy to work with and great at playing to the crowd throughout the night. Even with the multiple special requests we made of him, the presentations he did, and a last minute arrival of Nordy from the MN Wild he adapted on the fly for all of it and helped make our day amazing. To sum this all up, we definitely recommend you check out Fab Weddings for your big day. Their friendly staff, complete wedding day solutions, beautiful venues, day-of experience, and expertise of the industry they are a must-have partner on your wedding day! Thank you again to Glenhaven Staff, Christine, Andrea, and George for making our day one we will never forget. Glenhaven events was beautiful!!!!! The staff were amazing and extremely helpful!!!!! They made my day super easy going and stress free!!!! ...From the start George took care of us. He made sure we had all the information we needed, presented highly organized spreadsheets of wedding details and costs, and was flexible when we inevitably changed our minds several times. I was already happy with Fab Weddings, George, Christine, and everyone that we worked with, but when it came time for the actual wedding day the Fab Wedding team just blew us away. Everything went without a hitch. All of the employees were attentive and clearly knew what they were doing. We couldn't have been happier. The same goes for our guests. We have heard so many comments from our friends and family about what a great wedding this was, or how this was the best wedding they've been to, or that it didn't seem like a wedding at all but like a celebration. Don't be scared off by the price. It's ALL INCLUSIVE! That means you don't have to hunt down a photographer, a venue, a caterer, a photo booth, a videographer, a DJ, an officiant, a coordinator, a decorator. . . Glenhaven (Fab Weddings) provides it all. Check them out, you'll be glad you did. Our daughter's wedding was at Glenhaven this past Labor Day weekend. It was an absolutely amazing place for a wedding!!!! Where do I start? The planning process (with owner George) is informative and fun. At all times, you know, to the penny what the costs are as George keeps and shares with you a very detailed and up-to-date spreadsheet of costs. George responds to communication very, very quickly. They can provide pretty much every need/vendor you could have for a wedding but you can definitely bring in your own if you want (we mixed it up a bit). The price is definitely fair. The site is gorgeous! The outside wedding site is lovely for photos and access. The inside is an amazing blend of rustic and elegance - and can go more either direction - depending on how you choose to decorate. It comes with a personal wedding planner who handles everything from decorating to making everything run smoothly on your special day. They make up for the rural setting by suggesting nearby hotels and a shuttle bus &/or re-furbished firetruck to transport your wedding party & guests. The DJ, lighting and sound system are top shelf. Their new beauty parlor was fabulous. The wedding party has a huge room downstairs for relaxing (arcade, pool table, foosball table, dining table, juke box, etc.). It is a terrific place to spend time prior to the service. Honestly, we couldn't have asked for a better experience. Check out Glenhaven - you will be glad you did.